I have always been fascinated by ridiculous sandwiches. Even when I was a kid and would see Dagwood, in the Blondie comic strip, make those crazy sandwiches, I was fascinated. In New Brunswick, New Jersey, there lives Rutgers University. Whenever you have a college, especially one as large at Rutgers, you get food trucks. These trucks, known as “grease trucks”, are exactly what you think they are: sandwich trucks. But these sandwich trucks spawned something interesting: The Fat Sandwich. The Fat Sandwich is a bad meal on a long roll. That’s the best way to put it. 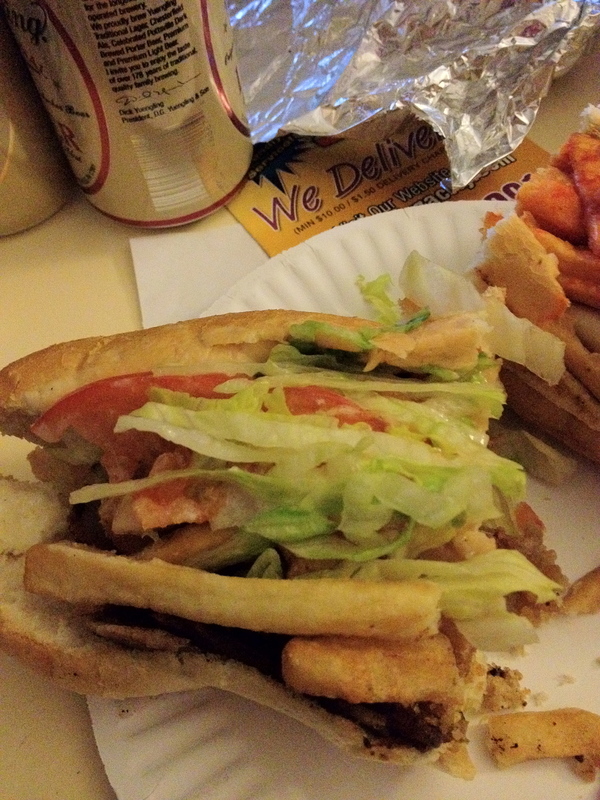 You feel like eating a cheesesteak with a side of fries? Well, why not just put the whole thing on the cheesesteak? Maybe you wanted Jalapeno Poppers as well? Put those bad boys on there too. And maybe some chicken fingers? Yup, everyone in the pool! So when I went to visit my friend Pat, who seems to be becoming my new food-partner-in-crime at times, we put down our beers long enough to decide to order some sandwiches. He steered me towards a place called Giovanelli’s. This place has a laundry list of fat sandwiches, as does a bunch of others. He really likes this place tho, so we ordered! First up is the Fat Phillipino. Not a very politically correct name, but the tastiness of the sandwich makes up for it. I felt a little better about eating it because it has a lot of lettuce and tomato on it. Maybe it’s a mini-salad? Yeah, let’s go with that. Now let’s take a look at this thing from the side and I will go over the things that are loaded in here. Are ya ready? (And please, click on the picture to get the full effect. Yowza!) 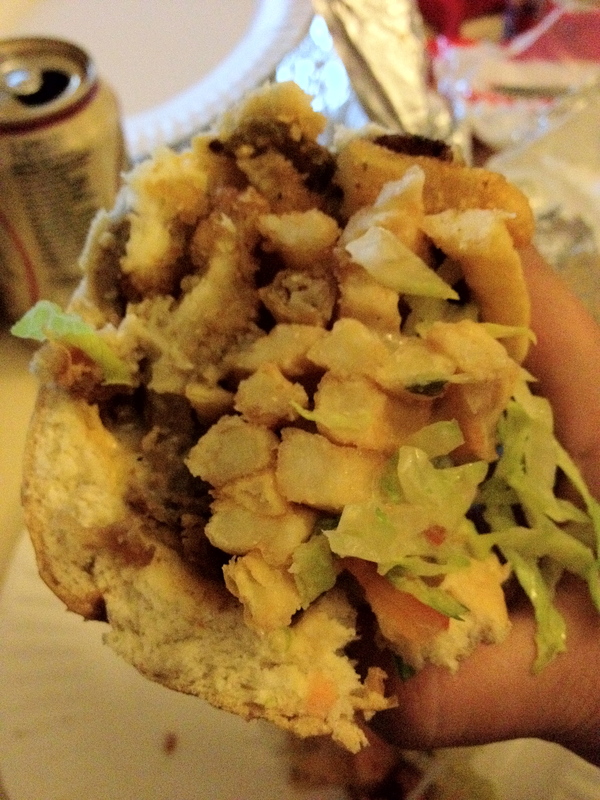 It’s got cheese steak, chicken fingers, gyro meat, mozzarella sticks, french fries, white sauce, lettuce and tomato. The fries were a little bit limp by the time the food got to us, but I’m ok with that. The sandwich is supposed to have white sauce on it, but it did taste a little dry. I imagine it’s because of the time of transportation and also because of the bread and the breaded ingredients within the sandwich. How did it taste overall? It was pretty darn delicious, I have to say. The second sandwich was the the Fat Giovanelli. I actually heard my Mom yelling at me in my head for eating this thing. The things I do for journalism! This one looks really harmless from the top, doesn’t it? That red you see is hot sauce. It’s actually not a very spicy sauce but it does give the sandwich a bit of a kick. It also made the sandwich a lot less dry then the other ones, but it could have used more moisture. But, like I said, I think transportation and bread’s moisture sucking qualities kind of did me in a little bit. Don’t despair, beer helped. Now check out the side shot of this thing (then go take your cholesterol meds). 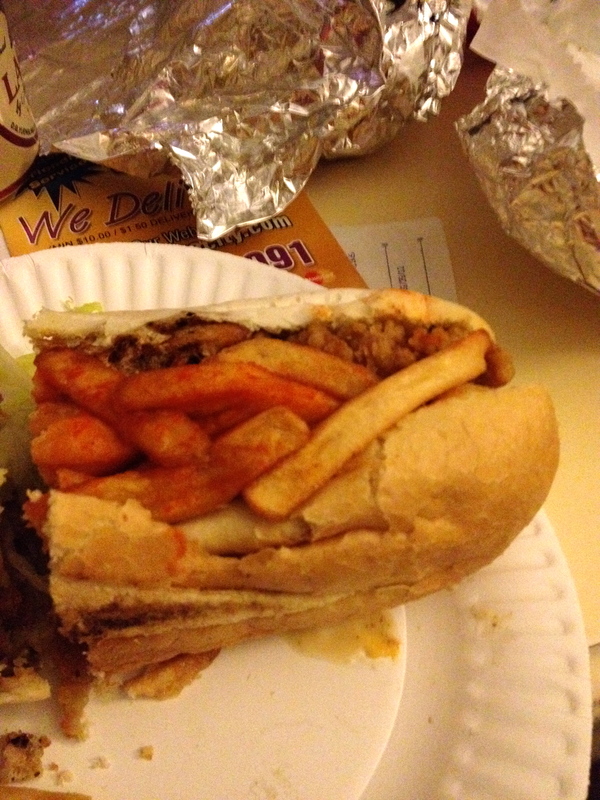 This thing contains: cheesesteak, chicken fingers, mozzarella sticks, french fries, bacon, egg, hot sauce. 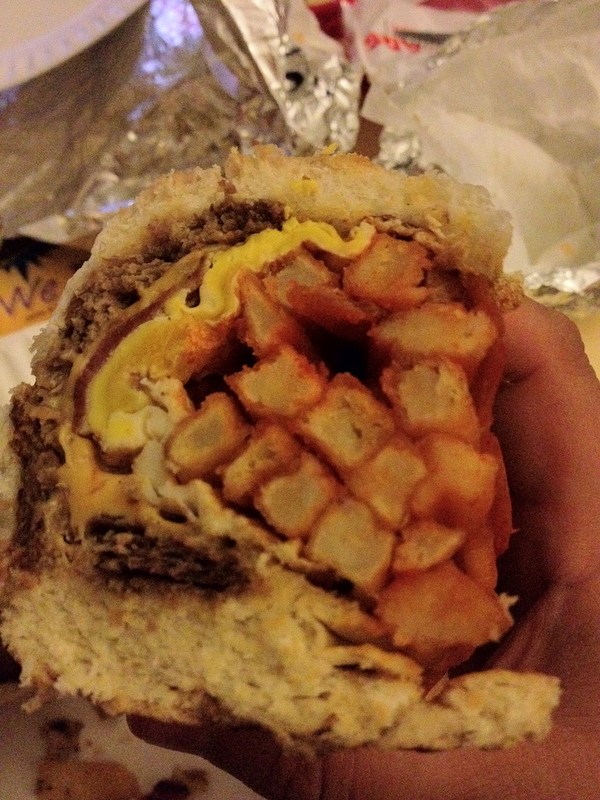 I am a HUGE fan of eggs on cheeseburgers, so when I saw there was a sandwich with egg on it, I was all over it. This thing does not disappoint. The egg gives the whole thing some more moisture and some great texture when you are up against the cheesesteak meat and the breading of the chicken fingers and mozzarella sticks. And again, the hot sauce moistens up the fries a bit. So, would I eat one of these monstrosities again? Sure. Do I think I can take on the challenge of eating 5 that one of the trucks does? No way. Will I be eating salads the rest of the week to make up for the damage I did? Probably. I’d like to try another kind of these at some point, so we’ll see what happens. But thanks to Pat Farley for being smart enough to not only graduate grad school but also to know where the good places to eat are!